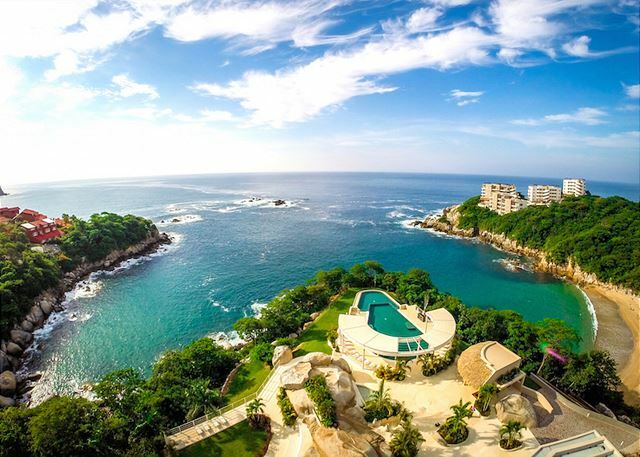 This exclusive beachfront development located in Arrocito, a protected cove on Huatulco's Pacific coastline, offers the absolute best condo experience in the region. This two-bedroom unit boasts luxury, views, and amenities galore. The master bedroom has a deluxe full ensuite bath, king bed and private oceanfront terrace access. The second bedroom offers a queen and single bed and has a dedicated full bath. The common space includes an open-concept living area, kitchen and dining area. The uber-modern design and furnishings really offer a state-of-the art living experience. The kitchen offers brand new appliances, a wine/beverage fridge and breakfast bar. The living area offers the best of both worlds: on one-end, a large-screen television for those moments where you just want to kick-back and watch a movie, or the other-end, a wall of windows looking out over the expansive Pacific vistas! The indoor dining area offers seating for eight guests. There is also an outdoor dining option that includes seating for 4. The unit also offers private laundry machines in the unit, satellite cable, and wifi. POOLS: Guests in this unit can enjoy use of the pool located directly in front of this building and/or the expansive Peninsula pool located centrally within the grounds. RESTAURANTS/BARS: Another unique selling feature for this complex are the onsite restaurants/bars. Alongside the Peninsula Pool, you will find a pool bar that serves drinks and light fare. If you're looking for more of a sit-down experience, you can reserve a table at the Ocean Bar, recently featured in USA Today, where you can access a full menu and beverage list. FITNESS FACILITY: A modern fitness club is a very hard-to-find feature in Huatulco's resort offerings. This fitness club offers brand new equipment, lockers, water and towel service and best of all - views while you work-out! After exercising, you can reward yourself by walking down to the beachclub and treating yourself to a frosty beverage! CONCIERGE SERVICE: This gated community offers on-site concierge staff who can assist you with anything you need during your stay. They can make transportation arrangements, assist with restaurant reservations, and more. 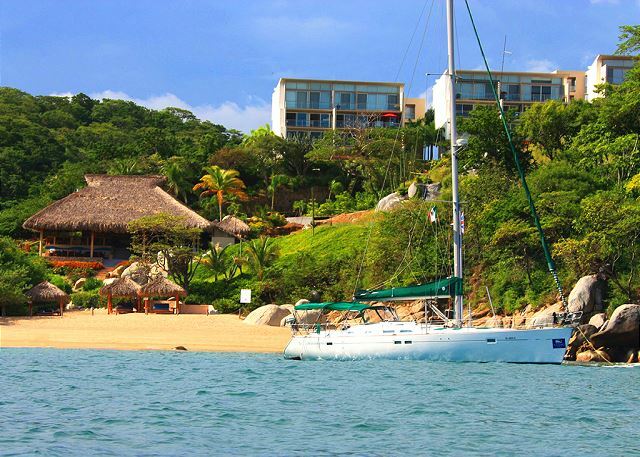 We look forward to helping you build your dream vacation in Huatulco! Fantastic Vacation Rental Company. Very warm and caring people on site. Could not have asked for better service and attention towards making our vacation complete and worry free. Thank you to Kerri W, Cathy B, and Martha for the wonderful experience. Great facility with good weather. Very good value. A great vacation experienced. Had a wonderful time and made many great friends that we keep in touch with. Dear Clifford, Thank you for taking the time to share your experience at Cosmo 1B1. 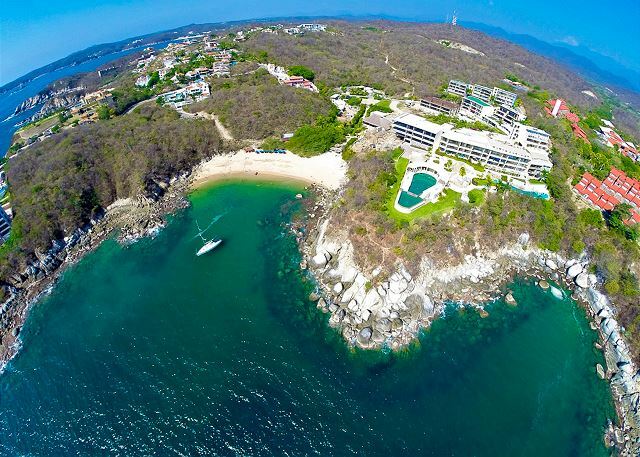 I am thrilled to know that you had a great time in Huatulco. Thank you for joining us at each Happy Hour! Looking forward to meet you again next year. Regards, Cathy Bergamo & Your Friends at My Huatulco Vacation. Everything was perfect, from first contact to checkout. I would highly recommend this rental company. They completely took care of our family from day 1. The condo was in perfect conditon and any concerns were looked after very promply. The view and Cosmo itself were beautiful. Thank you so much Renee to share your experience at Comso 1B1. I am truly happy to know that you enjoyed your stay and everything worked out perfectly. I will be happy to have the opportunity to host you and your guests again in the future. Take care. regards, Cathy Bergamo & Your Friends at My Huatulco Vacation! Great place, nice vacations for the whole family. Great service by everyone!! Cleaning and cooking. The condo was very well equipped, furniture is nice and all what you need. Incredible swimming pool with infinity view. Nice beach, kind of crowded, but as consequence of our date (1week of the year2018). Just a recommendation.....improve the pool towels and the pillows. Relaxing, Upscale, and Not Touristy! The Cosmo is an upscale community with everything you would expect in the finest hotels (restaurant, gym, multiple pools, cleanliness) buts it's a private residency! Our condo had everything needed and the decor and quality exceeded our expectations. Location on the beach could not have been better, security was great getting us taxis quickly into town. Can't say enough about this place - both the Cosmo and 1B1 are an 11 out of 10! Best vacation ever, Huatulco is a hidden gem, I hope stays like that for a long time.